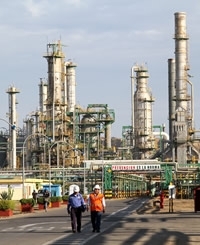 State oil company Petroperú has received US$1.3bn in medium term financing backed by Spanish credit agency Cesce for the Talara refinery modernization project (PMRT) which is due ready in 2021. Thirteen international banks participated in the funding which has a 3.96% annual cost and a 10-year repayment term which begins six months after PMRT comes online, the Peruvian NOC said in a statement. The disbursement covers approximately 85% of the project's financing and will cover the overhaul's required financial needs through the first quarter of 2020. Petroperú raised US$2bn for PMRT through bond placements in 2017 and will evaluate alternatives in 2019 to complete pending financing for around US$600mn. Meanwhile, the government published a law, available here, in the official gazette that authorizes Petroperú to participate in exploration and production contracts, after congress approved the legislation last week. The company also confirmed an attack at kilometer 193 of the Norperuano oil pipeline in the district of Morona, Loreto region, 500m from the community of Mayuriaga. Petroperú attributed the attack to local residents who it says had threatened action in a written statement over disagreement with results of municipal elections in the district. The state operator said that residents have not allowed personnel to enter the area to repair the damage and contain the spill.